Here's some insight into Caravaggio's importance to the Counter-Reformation. His style wasn't simply new, it was timely. "The Jesuits, founded by Ignatius Loyola in 1534, were central to the Counter- Reformation, and Loyola’s Spiritual Exercises, with its emphasis on achieving a mystical, personal relationship with God through a meditative immersion in the life of Christ, was important in indicating an appropriate artistic approach. In particular, the mystical was grounded in the corporeal, as experienced through the five senses. Hence the heightened, dramatised realism of the baroque, and its close attention to vivid, immediate detail. 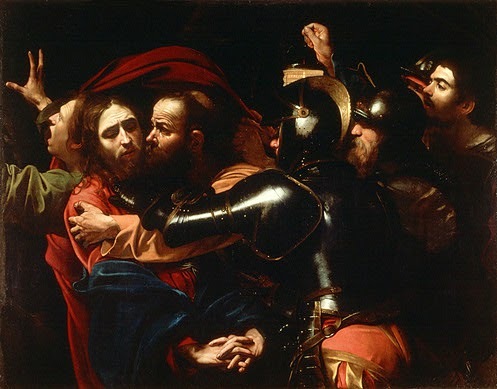 Caravaggio was a key figure in devising this revolutionary style. While the Reformation had reacted to the “idolatrous” depictions of the saints and downgraded their role – triggering not just the removal of paintings and statuary from public display but in many cases their physical destruction – the Counter-Reformation took a different corrective approach. So long as the painting reflected the documented life of the subject, and kept within certain bounds of correctness, artists were free to represent the saints as exemplary champions of the faith. And the more convincingly, physically real it was the better, a road that may have led eventually to Mel Gibson’s The Passion of the Christ. The Catholic Church, in other words, had a sound grasp of the importance of images." See the whole article in the Irish Times. BC Book Prizes: Shortlists announced!